Description: A detouring BNSF westbound rolls through Bayside Yard. Description: Detouring around the "horn" at Everett. Description: A BNSF B40-8 looking good in fresh paint. Description: Cruddy conditions, but how often do these locos show up in south Georgia? NS train 57Q rolls through Sparks with an ADM bean train. Description: One of my favorite locomotives. Description: Middle unit on Northbound Z train passing Guthrie Depot. Description: Crappy weather again, but in any case the trains are running. BNSF 8606 is the last of 4 units on a piggy back train. 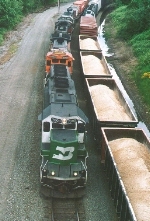 Title: BNSF 8635 and other's want there picture taken. Title: BNSF 8606 roster shot. Description: seen sitting at galesburg.